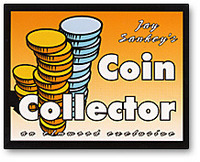 Today, when you order "Coin Collector trick by Jay Sankey", you'll instantly be emailed a Penguin Magic gift certificate. You can spend it on anything you like at Penguin, just like cash. Just complete your order as normal, and within seconds you'll get an email with your gift certificate. This is probably the only trick from Jay Sankey that I don't like. It's got the same feel as Holy Moly does. You show two cards, each with a picture of a coin on it. You give one to a willing victim...excuse me...spectator to hold. You give your card a bend and a real coin pops out leaving the card empty. Then you take the coin and make it vanish and appear on their card. The effect is nice but the handling is kind of awkward. The cards are plastic and business-card sized. They are also green. Not so bad for it's price. You can have a go at it if you like.